Kyocera Direct’s time and attendance tracking system KYOtime gives you the tools to track time and attendance, manage shifts and leave, create and modify schedules and manage staff. Our KYOslip, payslip and document delivery solution enables documents such as payslips or marriage certificates to be send via text message, at a kiosk or via a browser to employees. It also provides a platform to log pay queries, apply for leave, scan documents and print out payslips via a kiosk. KYOslip is an innovative, easy to implement and cost effective payslip delivery service allowing employers to deliver documents such as payslips, tax certificates, pension statements and newsletters via sms, email, online or via a kiosk. 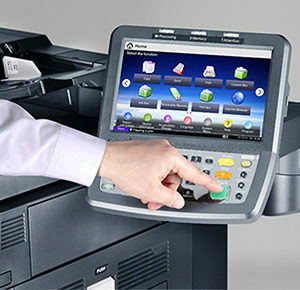 It's latest feature allows you to print, scan & apply for leave from a Kyocera Hypas enabled Printer. KYOTime enables you to track time and attendance, manage shifts and leave, create and modify schedules, identify potential over and under staffing issues whilst providing organisation wide insights into how to allocate your resources.